Subaru has revised the XV crossover, with an updated cabin, slight styling and economy tweaks and a new infotainment system. The updated model goes on sale in March and prices are unchanged – the 2.0-litre petrol manual in SE trim costs £21,995 while the top-spec SE Premium diesel costs £25,995. The 2.0-litre 150PS petrol engine has been revised slightly to improve economy – the CVT automatic version now has an official figure of 43.5mpg, a two per cent improvement. The 2.0-litre diesel 147PS diesel has been revised too, with an economy improvement of four per cent, to 52.3mpg, with emissions of 141g/km. 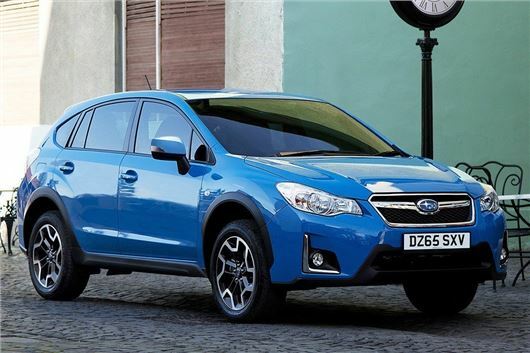 While those figures may not seem particularly impressive at first glance, it’s important to remember that the XV is only offered with all-wheel drive. The petrol engine is available with either a manual transmission or a Lineartronic CVT automatic, while the diesel is available with a manual transmission only. Inside, the revised Subaru XV has an updated dashboard with new, higher-quality materials and a choice of new finishes, including piano black. There is also a new 7.0-inch touchscreen system which incorporates navigation and smartphone connectivity, including Siri voice commands for those with an Apple iPhone. There is also an additional USB port in the front and a standard-fit reversing camera. Externally there are some subtle styling tweaks including new headlights, a new grille design, a new bumper design and a new rear spoiler. There are also two new colours – Hyper Blue and Dark Metallic – plus new alloy wheel designs.